Never give out passwords to friends. You may never know who they will talk to, what games they are playing, or even the website they are on. Never give out credit card numbers, pictures, phone numbers. your address or any other personal information. Do not lie about your age on a website many things may be inappropriate for kids. ou are not used to going to. Please do not be on things like facebook and twitter 24/7. There’s more to do then just be on a computer. Always let an adult check your account on websites like that. Because if you are harming somebody online you could get into big trouble. And let them check to see if you are putting to many personal things online. Let your parents check your accounts about twice a week. If you have to pay for an account then ask your parents first, because it might not be worth paying for. Do not put personal information about your friends online, they might not want info about them on a website. Never post information about where you are at, at that time. There are many people that will see your post. 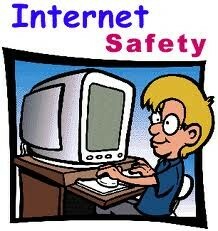 If there is someone that is harming you online then contact a trusted adult! Always block someone if they want you to meet them in a place! Never talk to someone that you don’t know, they might be a kidnapper. If someone asks for your address, and they look and even sound like a kid, never give out your address because they might be a robber or they want to kidnap you. If you put a picture online and then take it off it is always going to be there! Whatever you put online will still be there. Don’t reveal personal ideas to strangers or just met friends. Only have friends online that you actually personally have known. Never let a person that you just met look on your account. Do not answer a chain e mail. It might be asking for information from your friends.Do not download files from friends and family unless you know what is in it. Limit your time you spend online. Have a certain amount of time that you spend online because friends, strangers, and family can know when you are online. They might want to chat you. If they do and you completely know them then you can chat them, but if it is someone that you don’t know and they start talking then turn the computer off and go spend time doing something else.